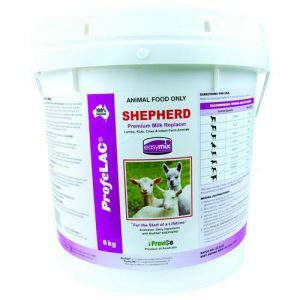 HYGAIN SHOWTORQUE is not only a low dose, high fat, cereal grain free feed, that promotes lean muscle mass development, no, on top of all that it also enhances hoof growthand coat shine. 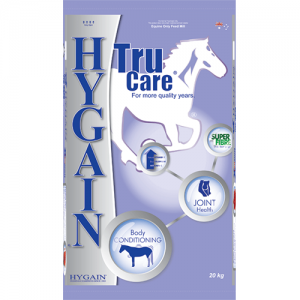 Topline building at its best, HYGAIN SHOWTORQUE provides sensible energy through slow release sources combined with essential amino acids and bio-available antioxidants for muscle tissue repair and to help manage the stresses of training and competition. It is THE feed everyone is raving about!! MICRLUPINS®, MICRBEANS®, Sunflower Seeds, Full Fat Soya-bean Meal, Soya-bean Meal, Canola Meal, Hy-Fibre Soya Hulls, Pollard, Lucerne Meal, RBO® (Rice Bran Oil including Omega 3, 6 & 9 essential fatty acids and Natural Anti-Oxidants), Natural Vitamin E, Molasses, Calcium Carbonate, Di Calcium Phosphate, Salt, HYGAIN® Vitamin and Chelated Mineral Premix, Lysine, Methionine, Vitamin B1, Prebiotic (MOS), Probiotic (live yeast), Bio-Available Selenium and Biotin. Biotin – Biotin, a water soluble vitamin is required by the enzymes responsible for protein synthesis and as a result is an essential vitamin for the healthy growth of hair and hooves. Research has shown that biotin improves skin and coat condition, increases hoof integrity and is widely recommended by farriers, veterinarians and scientists. HYGAIN® RBO® – RBO® Equine Performance Oil® is a blend of rice bran oil, omega 3,6 & 9 essential fatty acids and natural anti-oxidants known to improve the health and structural integrity of cell membranes. RBO® oil plays an important role in maximising energy efficiency due to its energy dense nature and is digested efficiently in the small intestine reducing the ‘sugar high’ associated with high grain diets. RBO® promotes growth and development of the muscular system, top line and a healthy skin and coat. Vitamin B1 – Vitamin B1 aids in energy utilisation and may help to keep horses calm. Prebiotic – Prebiotics incorporated in HYGAIN® SHOWTORQUE® have a defined mode of action, promoting a healthy gut and supporting natural defences essential for optimum health and performance. 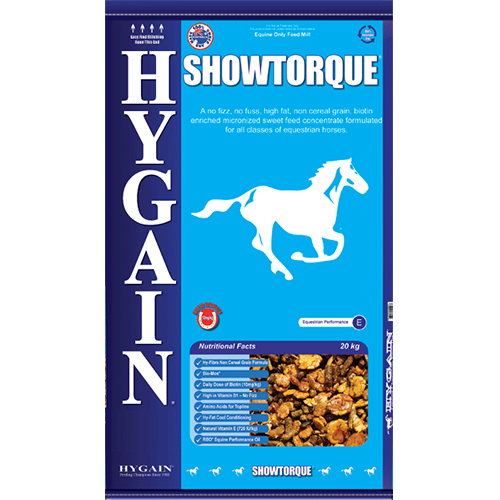 HYGAIN® SHOWTORQUE’S® high fat, non cereal grain, biotin enriched formula provides topline conditioning, the energy for competition and a healthy GLEAMing coat without the “fizz” associated with a high grain diet. All you have to do is add roughage. 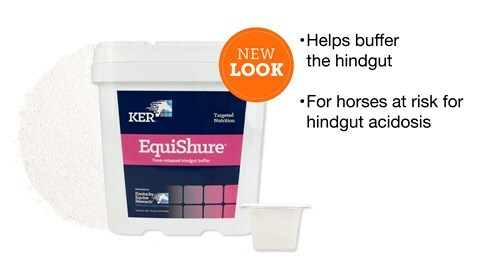 HYGAIN® SHOWTORQUE® should be introduced to your horse’s diet gradually. Feeding amount may be influenced by age, breed, appetite, exercise, desired body condition, pasture/hay quality and availability and climate. HYGAIN® SHOWTORQUE® should be fed in conjunction with quality pasture, hay and/or chaff. 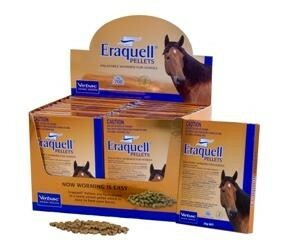 HYGAIN® SHOWTORQUE® is a nutritious palatable feed concentrate. Care should be taken to match feed intake to body condition and workload.